Alcoholic beverage named for the Mexican town of Tequila. Traditionally distilled from the fermented mash of the blue agave, which grows in the Mexican state of Jalisco. 5) Extra Añejo ("extra aged" or "ultra aged") – aged a minimum of three years in oak barrels. This category was established in March 2006. Choosing: Note the types of tequila available. All tequila has one of the following labels: Blanco, oro, reposado or reserva. Understand tequila blanco (white or silver). This tequila is bottled immediately after distillation and exhibits the distinct peppery flavors of the blue agave plant. Become familiar with tequila oro (gold). Tequila labeled gold or oro is aged in oak casks for up to four years. It features a mellower flavor and heat than white or silver tequila. The distinct caramel color of gold tequila is attributed to the aging and the addition of colorants. Know about tequila reposado (rested or aged). Tequila that has been aged in either white oak casks or stainless steel vats for at least 1 month and up to 1 year is labeled reposado. 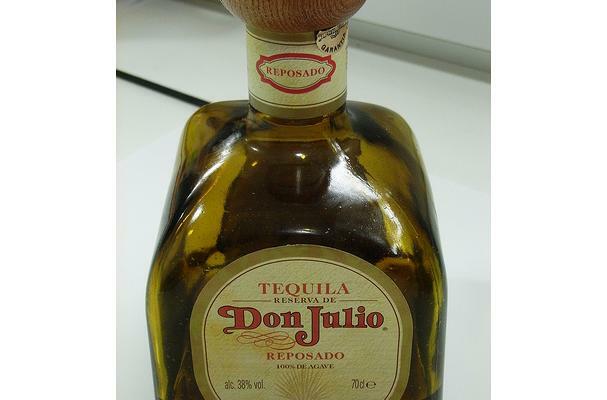 This type of tequila has a smooth, gentle heat as opposed to the biting heat of other tequilas. Identify tequila reserva. Not technically its own category, reserve tequilas are aged for up to 8 years in small oak casks. Reservas feature smooth and mellow flavors and heat. Buy the less expensive white or silver tequila if you plan to make mixed drinks. Enjoy reserva tequila on its own. Drink it neat or on the rocks and hold the mixers. Mixing expensive tequila with cheap soda is a waste of money and good tequila. Be a responsible tequila drinker. All tequila is 40 percent alcohol by volume (80 proof). Don't overdo it. Make sure the tequila you want to buy can be shipped to your state. Some states have shipping restrictions for wine, beer and spirits. Buying: Tequila are easy to get. You can buy tequila on your local liquor store or your nearest supermarket. Tequila is basically an alcohol beverage but today, tequila's are used for cooking and non alcoholic drink as well. If you have a large selection of tequilas, and you want to store them to enjoy at a later date, you should keep a few things in mind. First, unless the top is completely sealed, it will slowly lose alcohol. Bottles sealed with wax are the least likely to evaporate. Corks dry out, and shrink, so they will lose the most. natural corks also break and fray, so they can be less effective for sealing bottles than artificial corks. Some of the fancier bottles may present a challenge for storage because of their shape and cap. If you plan to put a tequila away for a long time, consider purchasing the plastic sealers used in the home-wine business or some heat-activated shrink wrap. These can usually be shrunk with a hair dryer or painter's heat gun. Air contains oxygen, and oxygen will affect the tequila, and cause it to lose flavour and aroma. The more the air in the bottle, the greater the effect of the oxidation. The speed of the oxidation depends on many things, including the tequila, the seal on the bottle, the temperature of the storage, and how airtight the seal on the bottle is. emember that when you open a bottle of tequila, even for a single sip, you subject its contents to oxidization, just as you would a bottle of wine. This can rob the tequila of its agave flavours in a matter of a few weeks to a month. Tequila doesn't last indefinitely. You have to drink it soon - usually within 1-3 months - otherwise it starts to lose its zest. You can always lay down an unopened bottle to keep the cork moist, but if it is opened, you should periodically tip the bottle to wet the cork in the tequila to keep it swollen. Also, watch for leakage when you lay a bottle down, because the cork may be dry and not expand immediately. Some bottles are sealed with wax on top of the cork (or a plastic wax substitute). These usually help keep an unopened bottle airtight. In 2003, Mexico issued a proposal that would require all Mexican-made tequila be bottled in Mexico before being exported to other countries. The Mexican government then said, AREEEBA AREEBA AREEBA ONDOLE ONDOLE! Liquor companies in the United States said that Mexico just wanted to create bottling jobs in their own country. Liquor companies in the United States also claimed this rule would violate international trade agreements and was in discord with usual exporting practices worldwide. The proposal might have resulted in the loss of jobs at plants in California, Arkansas, Missouri, and Kentucky, because Mexican tequila exported in bulk to the United States is bottled in those plants. On January 17, 2006, the United States and Mexico signed an agreement allowing the continued bulk import of tequila into the United States. The agreement also created a "tequila bottlers registry" to identify approved bottlers of tequila and created an agency to monitor the registry. History: Tequila was first distilled in the 1500-1600's in the state of Jalisco, Mexico. Guadalajara is the capital of Jalisco and the city of Tequila was established in about 1656. This is where the agave plant grows best.